December 7, 2018 (LifeSiteNews) – The journalist and book author Paul Badde, who lives in Rome and works for EWTN, has worked for years on the history and significance of an ancient relic that has been cherished by Christianity for a long time, but had been lost for some centuries: The Holy Face of Manoppello – which is believed be a miraculous picture of Our Lord at the moment of His Resurrection. LifeSiteNews conducted an interview with Paul Badde because he has just published in English a new booklet which sums up the recent developments and findings concerning this relic, which includes the prominent and public support of this relic and its authenticity by Archbishop Georg Gänswein, Pope emeritus Benedict XVI’s secretary. LifeSiteNews already published a book review of this booklet when it first appeared this year in German. The book review can be read here. However, the English version, as now published by Sophia Press, contains some additional information. In this new interview, Paul Badde reveals how intensely the Holy Face of Manoppello – or the Volto Santo, as the Italians call it – is involved in the Church’s recent history. Paul Badde shows, for example, how Cardinal Joachim Meisner visited the Holy Face only a short time before the 2005 Conclave. At that Conclave, with Paul Badde’s help, Cardinal Meisner was able to show his fellow cardinals that there then existed an attempt – by people such as Cardinal Achille Silvestrini, Cardinal Walter Kasper, Cardinal Karl Lehmann, Cardinal Godfried Danneels, Cardinal Murphy-O’Connor, Cardinal Audrys Juozas Bačkis, and Cardinal Carlo Martini – to prevent Joseph Ratzinger’s election. As Badde then heard it, they had intended Cardinal Martini’s election. During that same Conclave, however, he also later heard in Rome the name Jorge Bergoglio mentioned. Cardinal Meisner succeeded in his struggle – with a picture of the Holy Face kept in his pocket – and Joseph Ratzinger became Pope. The rest is history. LifeSiteNews: You have already written extensively about the Holy Face of Manoppello. What is the reason that you wrote yet another book on this topic? Has there come forth new evidence about its veracity? LifeSiteNews: What would you tell someone who is new to this topic: what are the main reasons to believe that the Volto Santo is truly the Face of Jesus Christ when He walked this earth? 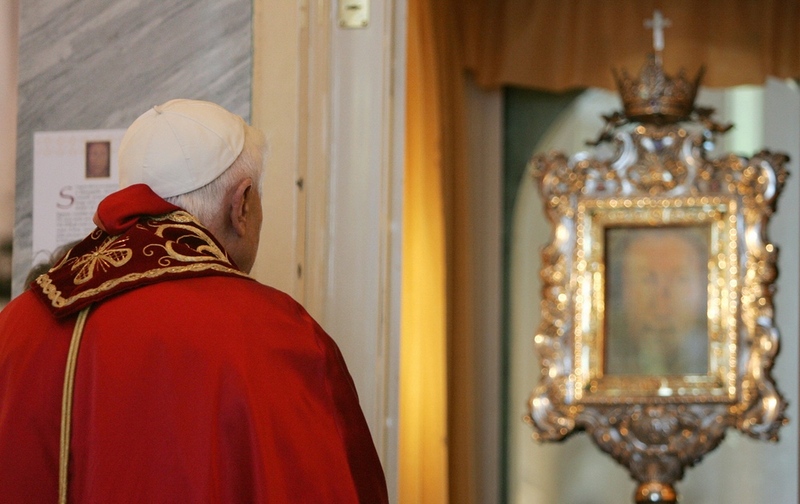 LifeSiteNews: It was the private secretary of Pope Benedict XVI, Archbishop Georg Gänswein, who not long ago participated in a public procession with a copy of the Holy Face in Rome, a procession that was done the first time in the year 1208. What was his message presented in his homily? Paul Badde: Yes, that’s right. But to start with, I would like to say this: Some weeks ago Archbishop Georg Gänswein presented here in Rome Rod Dreher’s Book The Benedict-Option in the Italian Parliament where he called the actual crisis another nine/eleven in the Church. What I found more amazing, however, was that he used the term “eclipse of God” to identify the inner character of the catastrophe we are experiencing in these days. It is an expression which has been used by Pope Benedict time and again and which stems from the Jewish philosopher Martin Buber if I recall it correctly. And here we should not forget that the eclipse of the sun means that the moon comes between our planet and the sun, blocking the sun from our view. It doesn’t mean that the sun ceases to exist. So in an analogy to the eclipse of the sun, we have the eclipse of God. This doesn’t mean that God has ceased to exist. It means that sin has come between ourselves and God, making it seem like he is no longer present to us. And in our times, it’s clear that it is the satanic shadow of the sins by the Church that make it appear to many that God is no longer present. But God still exists, of course. And this is exactly the time when the Holy Face now reappears in the United States, where the Catholic Church is haunted by the news of so many troubles and sins and crimes committed by priests. As to your initial question, though, I have to tell you that it was precisely Archbishop Gänswein, the secretary of Benedict XVI, who started, as I said, on the vigil of Sunday, 16 January 2016, in the Parish Church of Santo Spirito in Sassia (close to Saint Peter’s) a new tradition of venerating the Holy Face (again), when he introduced a new feast on the day “Omnis Terra”, which is the second Sunday after the Feast of Epiphany, remembering the day in 1208 when Pope Innocent III. had first shown the Holy Veil in public in the Latin Church of the West. This Sunday is called Omnis Terra with the words of Psalm 65. Omnis terra adoret te, Deus, et tibi psallat! That means: ‘All the earth worships You, O God, and sing psalms for You!’ This psalm was sung here also eight hundred years ago; and even then, as today, the Gospel of the wedding feast of Cana was proclaimed in Catholic churches around the world. Empires have fallen since then, swept away like autumn leaves; the Church saw the continuous succession of ninety-two popes. Violent revolutions and wars have shaken Europe; fatal divisions have lacerated Christianity. So the tranquility seems like a miracle with which, in the liturgy of this Sunday, we sing today as then: Praise the Lord, all peoples! [It is the holy image which the Pope] showed to the pilgrims and which for more than four hundred years has been preserved in Abruzzo, near the Adriatic Sea, in an outlying area of Italy, and which for the first time was brought back to where its public worship began in Rome. From here, innumerable copies have spread the Christian awareness of the existence of a true The Holy Face and Veil throughout the world. In this lies the deepest meaning of this moment. Before coming to Rome, the Sacred Veil was guarded in Constantinople, prior to that it was in Edessa, and even earlier it had been in Jerusalem. This face cannot be the property or the jealous treasure of one place, one church, or one owner, not even of the popes. It is the ‘trademark of Christians.’ It is only we who know that God has a face; only we know who and how He is. For this reason, the face of Christ is the most noble and precious treasure of all Christianity, indeed of all the earth, omnis terra! To this face we have to set out ever anew—always as pilgrims; always to areas of the periphery of our conception. And always having only one goal in front of us: the moment we will face him face-to-face. Amen. LifeSiteNews: Could you tell us some of the names of high-ranking prelates that so far have visited Manoppello? Paul Badde: I alone and personally accompanied Cardinal Meisner, Cardinal Wetter, one half of the German Bishops’ Conference (who had been ordered to go there by Cardinal Meisner in 2007 or so), 40 African Bishops in the winter of 2010, Cardinal Erdö, an entire congress of orthodox and western prelates, Cardinal Koch, Cardinal Pell, Cardinal Sarah, and Cardinal Tagle. However, a much bigger number of bishops and high-ranking prelates you can now find in the register of the Cappucin friars in Manoppello. LifeSiteNews: You once described Cardinal Joachim Meisner’s visit at the Shrine of the Holy Face. What would you say was the significance of the Holy Face for this German cardinal? Paul Badde: Here again, I have got to tell you a little story of his visit: My first article about the Holy Face had appeared in the German daily newspaper DIE WELTin Berlin on 23 October 2004. In January of 2005, I met Cardinal Meisner, who had come from Cologne down to Rome, and he asked me whether I could take him to Manoppello, and we agreed upon a pilgrimage to there on 4 April 4 of that year. But on 2 April, Pope John Paul II died, and my wife and I wondered whether Cardinal Meisner would show up at all. And be mindful of this, those were days when journalists from all over the world flocked to Rome. So it seemed a little odd to leave the town in those days as a correspondent for my newspaper. But at 7 O’clock in the morning, the Cardinal rang at our door, so it was clear that we had to go. He had asked Cardinal Joseph Ratzinger for an extra dispensation to do that. We drove very fast – praying a rosary. In the middle of Italy, however, Cardinal Meisner got a phone call from the Vatican, in which he was invited for a last farewell to John Paul II in the Sala Clementina in the Apostolic Palace, where he was lying in state. Which meant that I was to drive even faster. We arrived in Manoppello, where the Cardinal immediately got on his knees in front of the Holy Face, and there we prayed together another rosary. Then Father Carmine Cucinelli, the Rector of the Shrine, carried the reliquary with the Holy Face into the court of the convent for the Cardinal, who at once then said: “In this Holy Face, the Heart of God becomes visible.” That’s what he also left as his impression and assessment of the veil in the guest book of the Friars in Manoppello. Then we drove back from coast to coast to Rome, where we arrived just before noon that same day, at about half past twelve, and where the Cardinal invited me to join him for a last farewell to John Paul II in the Sala Clementina. There, we prayed a fourth Rosary, right beside him, on our knees. So on precisely that day, after I had left the city I became the only journalist in Rome to have visited John Paul II for a last time. But later that day, Cardinal Meisner went to Cardinal Ratzinger and told him: “I’ve seen the Risen Lord today” and he repeated that in an interview with Radio Vatican. Fourteen days later, he entered the Conclave with a photo of the Face of God, as he told me. Whether or not he had been in Cologne in the meantime, I don’t recall. On 17 April 2005, however, a Prelate from within the Vatican called and informed me that he had evidence about a conspiracy of Cardinals who had tried to prevent the election of Joseph Ratzinger as next pope. It was the so-called Sankt Gallen group, as I know now, and the Prelate gave me also a list with their names, among them Cardinal Achille Silvestrini, Cardinal Walter Kasper, Cardinal Karl Lehmann, Cardinal Godfried Danneels, Cardinal Murphy-O’Connor, Cardinal Audrys Juozas Bačkis, and Cardinal Carlo Martini. I called Cardinal Meisner in the afternoon and asked him what to do in a responsible way, since I didn’t want to create a scandal. So I wrote an article mentioning the hints I had gotten, all of which appeared the following day, on 18 April, in the daily newspaper DIE WELT. On that day, Cardinal Meisner not only brought a photo of the Face of God into the Conclave, but also that article of mine and fought like a lion against this conspiracy, no matter how alone he was, and despite his limited Italian. “It’s been the hardest day of my life!” he later told me, not mentioning, however, any other details. But when the conclave was over, it became clear that Meisner had become the king-maker, or more precisely, the pope-maker. So this was the essential role that the Holy Face had played in the election of Pope Benedict, which makes it also easier to understand why Ratzinger himself traveled to Manoppello as soon as possible after his election. The Holy Veil has played a role for many popes, and it certainly will play a role for Pope Francis and future popes, too, though I don’t know its nature. But some weeks ago, Pope Francis spoke about a spiritual void within the Church, which caused – according to him – the entire catastrophe of the clerical sexual abuses. Cardinal Gerhard Müller more or less told LifeSiteNews the same the other day, when he talked about spreading atheism in the heart of the church, as the number one reason for the crisis. [It’s as if] we do not anymore believe what the four Gospels are telling us. And here we have the Face of God, which fills every void and emptiness – and which declares, with the power of silence – as Cardinal Sarah has put it – that all that we are declaring in our Christian Creed now for so many centuries, is true. LifeSiteNews: I heard that you are preparing a series of films for EWTN in Rome and Germany about the 20 mysteries of the four rosaries in the Holy Land. Is there any link between the Holy Face and that endeavor – and could you tell us a little more about it? Paul Badde: The Holy Face contains somehow the essence of the Rosary. That is the Face of the living God incarnated in Jesus of Nazareth, born of the Virgin Mary. LifeSiteNews: There are two keys to the city of Manoppello, one is in Pope Benedict’s hands and one in yours. Is there any meaning to this? Paul Badde: I understand it more symbolically, for there is no door there anymore in the city of Manoppello where these keys would really fit into. It’s true of course, that I made Manoppello known in some parts of the world, as for instance in Poland or in the Philippines. Pope Benedict, though, made it known to the entire world. And I do hope, of course, that this new book will open the doors to Manoppello a little bit wider also for American pilgrims who are looking for comfort in the crisis we are all facing and suffering. LifeSiteNews: What do you hope the fruit of the further knowledge among Catholics about this Holy Face would be? Paul Badde: What do I hope the fruit would be? That we will be better prepared to see Him again. Here I have got to tell you a last little story. I’ve been a friend for many years — until his death in 2002 — with Zvi Kolitz, an old Lithuanian Jew from New York, who cherished very highly the wisdom of Rabbi Loew, who lived in Prague in the 16th century. And today, I read in the news that in China, the first “designer babies” have been made. I wouldn’t say in that context, though, that the miraculous reappearance of the Holy Veil is part of the Second Coming of the Lord already. In Manoppello, however, you can already look into his eyes, the eyes of the God of Jacob. Dec. 13. 2018 correction: This article has been corrected to state accurately what an eclipse of the sun means and how it relates to an eclipse of God. Please see Veri Catholici- they are tweeting about the Synod. They support Bishop Gracida. Pope Benedict needs to reclaim the Papacy in 2019.